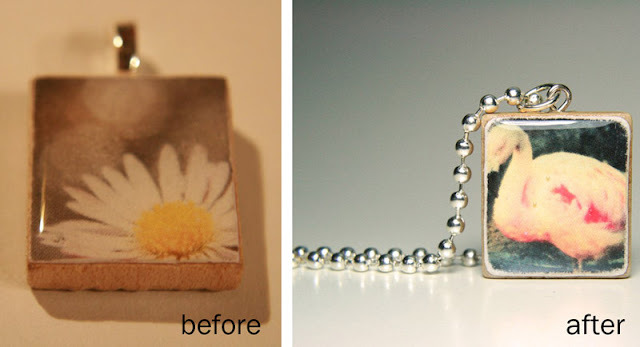 This week's fantastic photographic transformation features LittleGrayFox via Etsy. This Seattle-based artist creates a wide range of work from felt brooches and game piece necklaces to embroidered art and polymer clay miniatures. Check out her shop for all the foxy goodness! Shooting photos of your small object indoors without adjusting the white balance first can sometimes result in photos that are extremely yellow or "warm" due to the yellowish glow from tungsten light bulbs (standard incandescent bulbs). To ensure your colors stay true, be sure to check that your white balance setting on your camera is set to read the same kind of light that you're shooting under (incandescent, florescent or outdoors) for colors that are truer to your subject matter. 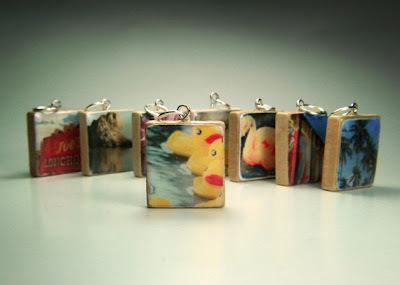 This group shot is beautifully done and really shows off the range of photographs that she has available in her shop. The slight reflection and the naturally gradient background created by using one reflected on an endless "sweep" (seamless background) is very nice too! How much have you played with your camera's white balance? Do you leave it on the "Auto" setting? Have you ever used the custom white balance setting? 5 Response to "Before and After: LittleGrayFox"
Great post. Photographing jewelry is such a hard task for me. It's like a never ending education. I use my camera on manual, and change the white balance when needed, but haven't used a custom white balance yet. Thanks for the lesson! I do not use the white balance adjustment on my camera at all (YET!) Now that I understand a little bit about how it works with the lighting...I'll give it a shot! What a transformation! I love it. Your blog has some great tips! I usually put my camera on manual, but I don't mess too much with the white balance unless my colors don't look right. I find taking pictures of my creations for my Etsy shop challenging. I've been keeping to the idea that natural lighting would give me the best picture, so most of my shots have been taken outside. I have had some decent photos, but am stuck when there is a rainy day! I have not tried the white balance on my camera yet either, but I definitely will be doing some experimenting now! Thanks for the helpful tips!